Over the last two decades there has been a notable increase in the number of corporate governance codes and principles, as well as a range of improvements in structures and mechanisms. Despite this, corporate governance failed to prevent a widespread default of fiduciary duties of corporate boards and managerial responsibilities in the finance industry, which contributed to the 2007-10 global financial crisis. 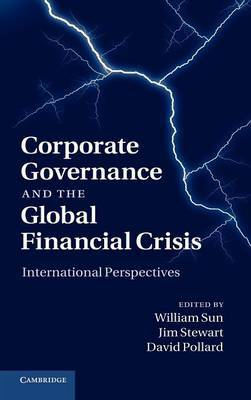 This book brings together leading scholars from North America, Europe, Asia-Pacific and the Middle East to provide fresh and critical analytical insights on the systemic failures of corporate governance linked to the global financial crisis. Contributors draw from a range of disciplines to demonstrate the severe limitations of the dominant corporate governance framework and its associated market-oriented approach. They provide suggestions on how the governance problems could be tackled to prevent or mitigate any future financial crisis and explore new directions for post-crisis corporate governance research and reforms.